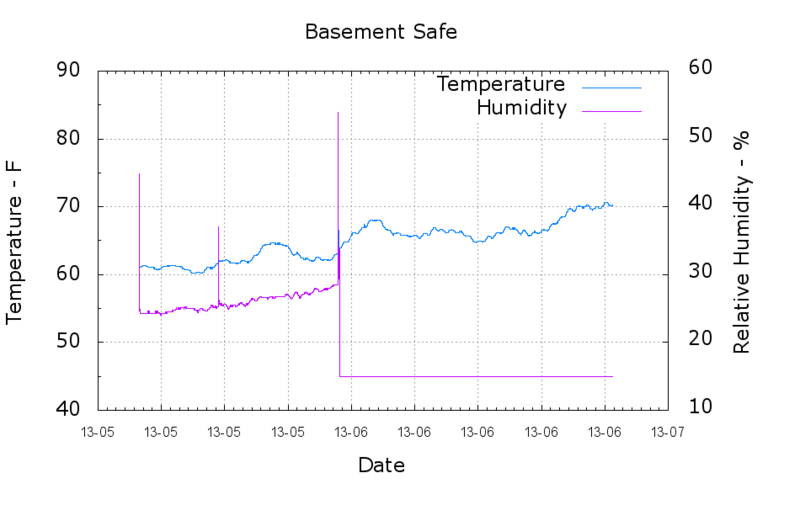 The new bag of new silica gel beads once again dropped the humidity below the Hobo datalogger’s 15% threshold, so I don’t know the actual humidity. The indicator cards packed inside the silica gel buckets report they’re below 10%; that’s dry enough for me. However, the bag now weighs 539 g, so it’s pulled 31 g of water out of the air over the last month. The old gel accumulated 63 g over five winter months, so there’s much more water in the air these days! The safe still has a tape seal around the door gap; perhaps a better gasket is in order.